While lying in a massage parlor a few blocks from home, letting someone with strong forearms unknead the knots in my back muscles, I listened to an interview on NPR’s Fresh Air with author Pete Hamill. 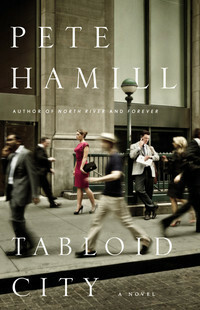 A journalist and columnist starting back in the 1960s, Hamill also wrote novels. He was on the show speaking about his most recent book, Tabloid City, a thriller that takes place in an old-school tabloid newsroom that is struggling to deal with the digital era. During the discussion, interviewer Dave Davies asked Hamill about a previous book he wrote, A Drinking Life, and his own struggles with drinking, which he eventually gave up cold turkey. It was Hamill’s response to the question, “What did your drinking take away from you?” that caught my attention and got me thinking. I was [a] very prolific journalist because I could always squeeze enough from my talent to get a newspaper piece done. What it took away from me was the courage to test the extent of whatever my talent was. … From a professional and personal standpoint a lot of it was about trying to find out what was there as a writer. Because my ambition was not to be better than Faulkner or Hemingway or anything like that. It was to be the best version of myself that I could conceivably be. This resonates with me because my own upbringing was very much along these lines. Both sides of my family, but particularly my mother’s side, really emphasized the idea that each of us has a responsibility to live up to our fullest potential in life. Unlike many of my friends, whose parents expected them to follow a specific career – doctor, lawyer, engineer, etc., my parents emphasized success by pushing me to be the very best I could be, regardless of what field I chose. To this day, when I look at my own performance I can be very critical of myself in areas where I recognize I’m not being the absolute best version of myself I could be. And, likewise, I can be very critical of others when I see that they are not making full use of their potential. What about you? What does it mean to you, to be the best version of yourself that you could conceivably be? This entry was posted in Uncategorized and tagged Best, Drinking, Fullest, Hamill, Life, Pete, Philosophy, Potential, Version, Yourself by christao408. Bookmark the permalink. You heard of Maslow’s hierarchy of need right? For me, achieving the top of that pyramid, self-actualization, is what I would take “being the best version of yourself” means. Not many people get to that point, but we sure can at least try! I hope you can recommend us a good place for massage when we are in town. I guess this place near your home is trustworthy? Personally I think I have achieved my goals as well as I possibly could. Wanting to be a physician was my own decision. But mother was always a driving force for ambitions and reaching the goals. Once I came here, I had only myself to critcize and try hard to better myself. God knows I have tried my hardest to be the best version of myself. Nice post Chris. Hope your back feels better after the massage. Some of us didn’t have that encouragement to live up to our potential, and so we struggle, even now. But self awareness takes hold, and we try. We struggle to push ourselves forward. And so, for me, I have not yet recognized the best that I can be. But I am not giving up until I find it. That is the same philosophy my parents had – I am very self motivated which has served me well. It also pains me to see my sons not living up to their potential. It makes me ask what I failed to do or what I did differently that resulted in their laissez-faire attitude toward being their best self. I tend to hold myself to a very high standard (ethically, spiritually, professionally) and I tend to be disappointed in others more easily. But I’ve learned to let go of that and am happier for it. I guess I could phrase this in a couple ways – total actualization – at peace with myself – feeling fulfilled. I am never really satisfied with myself. I always feel there is more to be developed. Yes, I do get upset with people who do not fulfill their potential. But I look and hope they are happy and which is more important or are they the same? I’m not sure what “the best version of myself” would be. Certainly I’ve had many failures but do I look upon them as my fault? I was merely trying to do my best. In an artistic sense if I could write better songs, paint nicer pictures…….but this dreaming impedes me from doing any art, I prefer to look at my best as being anything I do. i am definitely not the best version of myself that i could conceivably be. i understand how many people would have a hard time in doing so. there are, unfortunately, many factors in life that may prevent one to be the best version of his/herself. i do think that it’s also not literally the worst thing. despite my inadequacy, my motto has always been ‘take one day at a time’, appreciate the little things in life, and try to live life the best way one knows how. if only more people could do this, there will be much less disappointments and depression going on. than again, this is just my own view. I actually got a massage yesterday too… :] It feels so good! But… don’t people usually listen to soothing music while getting a ‘rub-down’ rather than something thought-provoking? As for aspiring to be the best… I’m always worried that ‘trying to be the best’ will make it so that I work harder at academics and what-not… but forget to enjoy the simpler pleasures of life. I don’t know. Life is a game. Most of the rules of the game are not decided by me but still I can change them a bit. By changing the rules, I enventually find life worth living, and now is the happiest moment of my life to date. Here is my motto: have few desires, be caring, be creative. In life we need to re-evaluate ourselves and become better. The world is changing at a rapid pace. If we don’t change with it, we will stay behind. The best version of myself is the version of myself that everyone expects me to be, because they all seem to have insane expectations, and because I believe that we should have an unattainable goal to always reach for. But then I realized the folly of all this, of how I’ll never be happy or be content or entirely fulfilled. 😦 This is excellent food for thought, something I’ll be losing sleep over I think. great post! i’m still thinking about what the best version of me means. you are lucky to have had the upbringing that you did. that’s awesome that you were empowered and affirmed from childhood. i did too, and i thought everyone else had that since i did. I don’t think I’ll ever know what the best version of mine could be- I think it’s more like climbing a never ending ladder. First off, thank you to everyone for such thoughtful responses. As I read your responses and gave more thought to my own situation in life, I have to wonder to what extent I really am the best version of myself I can possibly be. Certainly, on an interpersonal level I often fail to be as patient, as understanding, or as good a listener as I know I could be. I guess we never do reach the *best* version of ourselves because no matter what we achieve, there is always room for further growth.Responding to your thoughts:@Roadlesstaken – As a professional trainer and creator of training materials, I know Mazlow well. I think you’re right that his hierarchy of needs is a good definition of the idea of being the best version of ourselves we can be. @ZSA_MD – Privileged as I am to know you even a bit, I’d say you have spent your life showing the rest of us how to truly be the best version of ourselves. Thank you for recommending this post. @songoftheheart – Thank you, too, for the recommendation. @caki730 – Yes, I recognize that I grew up with a stable and supportive family, something not everyone enjoys. @murisopsis – I wonder if it is, to some extent, a midwestern trait? My parents are both very much the product of where they grew up. As for feeling like your sons don’t reach their full potential, I wonder if inevitably others can always see our full potential better than we can see it ourselves? I also wonder whether our own definition of “being the best version of ourselves” is different than others’ definition of it? @AzureRecollections – Sorry if this caused you any sleepless nights! You bring up a similar point to Val, in terms of wondering whether the definition of being the best version of ourselves is a definition best seen by others or best seen by ourselves. I don’t know that answer, but suspect that we have to ultimately find (and be happy with) our own definition. @Fatcat723 – Somewhere in that question – what is the difference between self-actualization and happiness? – is an important answer. @ohellino – @rudyhou – Thank you for your comments. I wonder if failure and inadequacy are a part of becoming the best version of ourselves? Maybe even a necessary part of it. Not only do they build character, but it isn’t until we’ve reached the point of failure that we truly understand where our limits are. Anything short of that point, and there’s still room to grow. @nurseynursey – I appreciate you sharing that. It would seem that facing a life-threatening illness would be as good a way as any to come to see what is really important in life and what isn’t. Recently, I’ve had several conversations with a friend whose father is struggling with cancer. In the wake of those conversations, I’ve imagined myself both in his position – but also in his father’s position, asking myself what would I do, what choices would I make, and what things would I wish I had done differently. There’s a lot of value in going through such an exercise and if you can go through it before actually facing a life-threatening illness, so much the better. @Pysia89 – @The_Eyes_Of_A_Painter – You both make such an important point, that it is the act of evaluating ourselves, looking deep inside to understand our shortcomings, that leads us towards being the best possible version of ourselves. Whether we make it to that goal or not, if we do not self-reflect, we will not be able to improve and to grow. @ClimbUpTreesToLookForFish – Such good points. The less we worry about our own desires and the more we concern ourselves with the well-being of others, the more we will become the best version of ourselves. @DrTiff – Emerson and Thoreau, both excellent authors to read for more on this topic! Thank you for making the observation that so often, people are mischaracterized as being selfish when they seek to become the best versions of themselves. It is not a bad type of selfish. As Ghandi said, we must become the change we seek. If we do not see ourselves clearly and push ourselves to be our best, we certainly cannot expect that of others. @yang1815 – Thank you Andy. @Dezinerdreams – And so long as we don’t get frustrated by the ladder’s never-ending nature, it can be an exciting climb! @CurryPuffy – The place we went was a pretty small local place, mostly geared to Japanese clients. Not super fancy but clean and the masseurs kept their hands in the appropriate places. @Devilzgaysianboi – The simpler pleasures in life are also a part of being the best version of yourself, wouldn’t you say? As for what I was listening to, I enjoy having the chance to listen to NPR podcasts and other broadcasts when I’m exercising or relaxing because it serves as a mental break, a chance to shift my mind to other things. I work all day with words and so don’t normally listen to music and certainly can’t listen to podcasts while working. I certainly don’t feel like the best version of myself, at the moment.The question implies that we have many versions of ourselves. That we can be different, that who we are now may be different to who we were in the past and you who we might be in the future, that there are discernible differences between our versions.Is it possible to have a different permanent mindset from previously, so that is classifies as a new version of ourselves? I think if I look hard enough, I can see slightly different versions of myself over the past 10 years – I would like to believe that I have a more realistic view of myself and of others than previously.To end, I think our mindsets play a big part in how we feel about ourselves. I am also not sure where I am going in my comment! Your post was thought-provoking and this is what I retrieved from my mind.Maybe I don’t feel a discernible different between versions of myself because I haven’t done many significant things in life. @stepaside_loser – Interesting thoughts, Andrew. One of the big questions I ended up with is whether we are the best person to evaluate whether or not we’re the best version of ourselves. Maybe some outside perspective is needed. I read this but didn’t answer because I was working most nights that week. This is a very thought provoking post. I’d like to think I’m reasonably ok but I know where my weaknesses and flaws are. They are like open wounds that fester if don’t do anything about them. Could I be a better version of what I can be? Absolutely. I like to think one of our purpose in life is to live up to our full potential. And at the end of my life, I want to be able to be at peace with myself knowing I’ve done my best. @ElusiveWords – It is hard to imagine that the end of our lives, that we would ever say, “Gosh, I wish I hadn’t been as good a version of myself.” That said, I also imagine that at the end of life, we would be unlikely to wish we had worked more hours, spent less time with loved ones, etc. We should never stop evaluating what the best version of ourselves is because the best version of ourselves changes periodically as we’re forced to curve our way through life’s dynamic highways. I love this post. As I get older, my thoughts turn from “who do I want to be” to “what am I doinging to become the person that I want to be”. Am I moving forward or standing still? And most important, do I still like my destination? I have found that my priorities have changed, and I’m ok with that. This is an excellent post. I could have done so much more than I did and now that I am older and retired, I am doing the things I never put forth the effort to learn when I was younger and in the working world. I have elarned so much about computers though self help tutorials and the same with photography which is my hobby and brings much joy to my heart to find the beauty fo the world around meIt is never to late to learn and become so much more than we ever thought we could be. @WritePassion – @fauquet – @tymedancer – Thank you all for your comments and I’m glad you enjoyed the entry. There is no doubt that as we grow older, we have the (potential) capacity for greater self-reflection. Many people recognize this and are able to adjust their course in life, following more interesting or fulfilling pursuits, adjusting their priorities, and focusing on the things they will find most worthwhile. @Hinase – Thank you for the recommendation. I wonder if part of the point in life is that we’ll never reach “best” – that’s what keeps us motivated to keep learning, keep growing, and to keep striving to be better versions of ourselves. @ItsWhatEyeKnow – Certainly, how we define “the best version” has to change as we grow, as circumstances change, and as we better understand ourselves and our abilities.